Because construction work is inherently dangerous, the risk of injury to workers is greater than in other industries and workplaces. However, construction workers have a right to a safe work environment. While construction injuries are usually covered under workers' compensation laws, it may be possible to pursue a lawsuit based on negligence against site owners, contractors, subcontractors, their employees and agents for violations of applicable safety laws. Construction accidents can lead to a variety of injuries. For example, many injuries require fingers, toes and limbs to be amputated. In addition, broken bones and fractures are common as are shoulder, knee and ankle injuries. 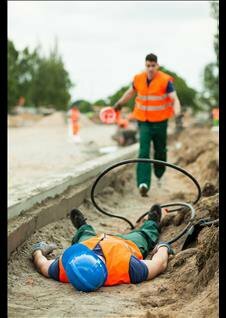 Workers can suffer head or brain injuries from falls or falling objects as well as spinal cord injuries or paralysis. Other common injuries include eye injuries or loss of vision, and hearing loss. If you are a construction worker who has been injured on the job, you have the right to be treated for your injuries and the right to receive workers' compensation benefits. If the injury was the result of negligence, however, you may be able to pursue a personal injury lawsuit.